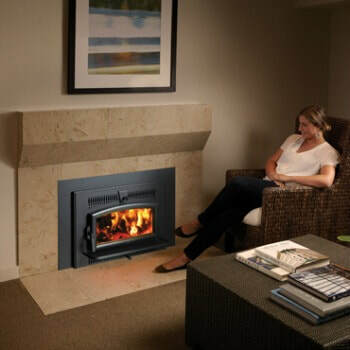 The Lopi Small Flush Hybrid Fyre flush fireplace insert sports the planet’s cleanest burning technology and comes in a convenient, compact size. This small fireplace insert can heat up to 1,000 sqft. With a 14 inch depth and 1.2 cubic foot firebox, this insert is ideal for small masonry or zero clearance fireplaces. With a unique quick flue connector with a removable flue collar, this unit can be easily installed. This insert features a stunning fire view, perfectly framed by a arched door and clear glass. A robust blower boosts heat circulation while not obstructing the design of the insert. With just 0.89 grams of emissions per hour, this unit tests at over a 76% overall efficiency. Lopi has completely eliminated slow, open door startups and laboring over newspaper with the optional Greenstart ignition system. Simply load the wood and push a button!